Jennifer Aniston’s perfume has been received with what I think is an odd sort of popularity in the fragrance world. Why am I perplexed? Well, it’s not that the stuff doesn’t smell good. It’s not even because I think it’s generic. It’s just that I had no idea Jennifer Aniston was still a very popular celebrity. Granted, the last time I watched a movie, a television show, or paid any attention to celebrities was about ten years ago. In Bottle: Clean and soft floral with a kick of citrus at the top and a bunch of white musk. Applied: Citrus opens up Lolavie and quickly makes way for the scrubbed clean florals. The scent is very light and refreshing. I can definitely see this being worn in the spring when the flowers have just started to come up. There’s no–or very little–sweetness to this thankfully as the predominant floral note seems to be lily according to my nose. There’s very little in the way of interesting progression as its dry down, I’ve noted, smells like sandalwood and white musk. All in all lolavie doesn’t leave a huge impression on me. It’s clean, it’s light, it’s fresh and it’s definitely a floral. Outside of those very basic facts there just isn’t a lot to comment on. Her longevity stinks due to how light she is but if you’ve been searching for a light, easy, floral perfume then Lolavie is a very good choice. Extra: Lolavie was Jennifer Aniston’s first fragrance release and I think she’s been trying to table a deal to make another one. Before this fragrance was even released there was a bunch of media buzz about how Aniston didn’t want a normal celebrity perfume and that she wanted something daring and new and different. I will hand it to her that Lolavie is different from the sugar piles of other celebuscents. But it’s not daring or new and hardly different if you compare it to mainstream offerings. It’s a good attempt though and Aniston manages to avoid the Britney Spears segment of celebuscents and is so far cruising along with Sarah Jessica Parker. Design: The one bone I have to pick with Lolavie is its packaging. The bottle is incredibly unwieldy. I have no idea why they designed the thing to be so big and–well, it’s just big and clunky. It’s a lovely shape. It’s an interesting twist on the standard classic perfume bottle look. But why does the thing have to be so enormous? The size of the bottle makes it difficult to hold and spray and is just unnecessary. Another thing that makes me cringe about the packaging is the typeface they chose. Reminds me a little too much of Times New Roman. Times being the typeface people associate with textbooks, technical manuals, and book reports they were forced to write in school. None of these things paints a particularly fascinating image of the scent within. Other than that, it’s a lovely simple design. Notes: Citrus, rose, jasmine, violet, lily, musk, amber, sandalwood. I modified the description of the notes list a little because I thought calling a blended citrus accord a “citrus grove accord” was pretty ridiculous wordage. Unless I’m to believe they crammed the citrus, the trees, the dirt, and farm tools into that accord I think calling it just a plain old ‘citrus accord’ is the way to go. What is it with these celebrity releases that they have to come up with the most bizarre ways to describe their notes? Do consumers really buy a perfume because they think they’re getting the smell of an entire citrus grove? No wonder perfume is so misunderstood and confusing. There’s so little consistency in the marketing. 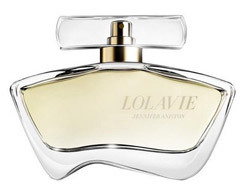 Reviewed in This Post: Lolavie, 2011, Eau de Parfum. This entry was posted in floral, fresh, Reviews By House, spin off and tagged amber, citrus, jasmine, lily, musk, rose, sandalwood, violet. Bookmark the permalink.